The New York Yankees' top draft selection is apparently officially in the fold. 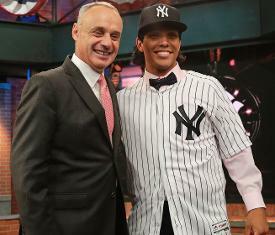 According to George King III of the New York Post, the Yankees signed first-round draft pick Anthony Seigler on Saturday morning to a deal with a $2.8 million signing bonus, right around the $2,815,900 slot value associated with that selection. Seigler, who was selected No. 23 overall on Monday night, is a switch-hitting catcher who was the starter on the USA Baseball National Team that won the 18-and-under World Cup last summer. This year, he hit .421 with 13 home runs and 16 stolen bases and threw out 12 of 21 potential base stealers in his senior season at Cartersville (GA) High School, earning himself First Team All-American honors and leading Cartersville to the Georgia Class 4A state championship game. He is also a capable switch-pitcher, who posted a 1.09 ERA and 29 strikeouts in 25 2/3 innings pitched, but the Yankees drafted him as a position player. In the official team release announcing Seigler's selection, Yankees Vice President of Domestic Amateur Scouting Damon Oppenheimer said this of the 18-year-old: "The thing that attracts you to Seigler is that he has the tools to catch, and he's a switch-hitter, which makes him a unique commodity. He's showing power from both sides of the plate, has really great instincts for baseball, a plus-arm and runs well for a catcher. On top of that, he's proven to be versatile, with his ability to play other positions. Seigler's got top of the line makeup. We're very happy about him." Based on multiple media reports, Seigler is reportedly the ninth of the Yankees' 40 draft picks to either sign or announce an intention to sign with the organization.